There’s a bit of a grey area here. 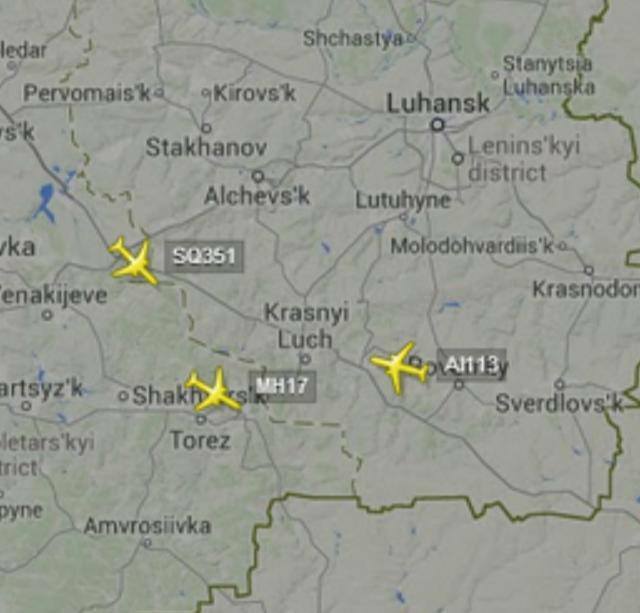 If Singapore Airlines had ordered all its pilots to avoid Ukraine airspace after this tragic incident of MH17, then “not using” would not be wrong legally but still a bit deceptive, whilst “are no longer using” or “have stopped using” would be an honest answer. Singapore is NEVER HONEST. Period. 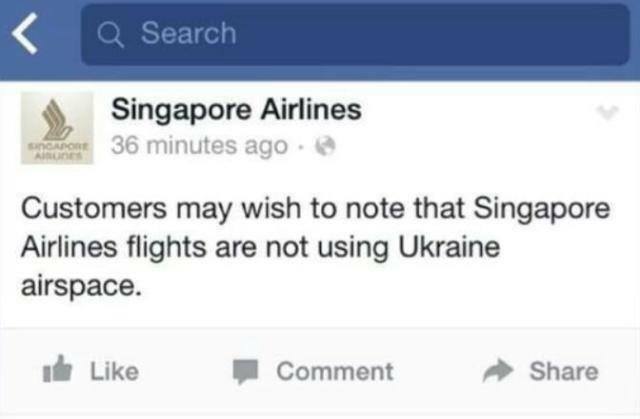 And will all this brouhaha make a dent in SIA’s international rankings, passenger volumes and credit ratings? I dare say that SIA has done, and is doing, a lot better than MAS post-MSA breakup. So, they didn’t use the best possible language in their Facebook post. Is the travelling public going to check Facebook first before choosing the airline they want to travel on? Is the “manufactured” uproar going to affect Changi Airport’s position as a regional air hub (a question that may not be strictly relevant in this thread). Writer was talking about neighbourly conduct you moron. Not who has the better business. Corbulo – you really don’t get it. The issue is not about who is doing a lot better business wise. And that is also not the contention of people who are upset about their FB status update. It has to do more about it about SIA not being sensitive to the plight of their own neighbour as well as not being honest about the fact that they have been using the same route as the unfortunate MH17, in fact, nearly twice as much as MH. That’s it. Sometimes, you need to clear your brain and try to understand what the issues are. We think SIA needs to show a bit more class. Consistent with a world class company, they are. Good that they’re making tons of money. We have no issues with that. No one is. But be honest. That is all. SIA doesn’t need to operate flight routes between Geylang to Orchard Road or between Woodlands to Sentosa Island. MAS has to service various rural areas especially in East Malaysia, otherwise DAP will start shouting that MAS and/or the Federal Government abandoned them and then some Chinese ladies will instigate to take Sarawak or Sabah out of the Malaysian Federation. The business model is significantly different. We’ll see if SIA can continue doing what it is currently doing in light of the emergence of Emirates, Etihad and Qatar Airways which also have similar approach. Who cares if SIA or Changi is making a lot of money? We, Malaysians don’t really care unlike the kiasu Singaporeans who always think about ‘Me-me-me-me and me some more!’ I do not think SIA didn’t use the best possible language, unless you’re suggesting that the Singaporeans are stupid, which I think is not the case. They’re cunningly ‘Me-me-me-me and me some more!’. As always. “Manufactured” uproar? Well, I think that is suitable in dealing with SIA’s “manufactured stupidity and insensitivity”. Generally, Singaporeans are always like that, menangguk di air yang keruh. During the Asian Financial Crisis 97/98, what did Singapore do as neighbours? Otherwise, the then Indonesian President would not have labelled it as ‘red’ dot’ and ‘not a good friend’. Your statements centred on money and status, which are central to all Singaporean values. Do you think we really care about Singaporeans making money? Go ahead la. Our KWSP gave higher dividends than Singapore’s CPF. If Malaysian and Indonesian leaders are as KIASU as Singapore’s, that cancerous lump in ASEAN would stand no chance to metastasise.